Over 1,000 students at University of Massachusetts Amherst stood For The Kids treated at Baystate Children’s Hospital. This year the students set out to raise $100,000 for the first time in their history. UMass Dance Marathon raises over $133,000 for Baystate Children’s Hospital. Together, the students “reached new heights” and raised over $133,000 for the kids. That represents a 49% increase from last year. The funds raised will support the new Pediatric Procedures & Infusion Unit at Baystate Children’s Hospital. This unit will see patients receiving various treatments ranging from chemotherapy to IV hydration during flu season. 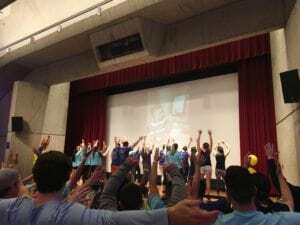 The UMass Dance Marathon leaders saw this new project as an opportunity to further connect their peers to the impact of their fundraising dollars. 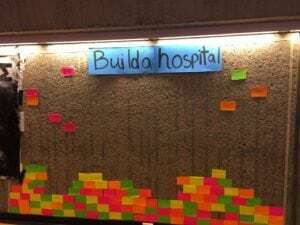 Because the Pediatric Procedures & Infusion Unit will see over 3,200 patients annually, they challenged each participant to raise $32 during the event as part of their “build a hospital” campaign. The beginning of the “Build a Hospital” campaign at UMass Dance Marathon. All the participants rallied behind this shared goal and added bricks the wall for every $32 they raised. Students who completed the challenge led one of the morale dances on stage. Collectively, the students raised over $20,000 during the event pushing them past their $100,000 goal. Students who completed the fundraising challenge lead the morale dance on stage. Thanks to each and every UMass student who participated in Dance Marathon this year For The Kids at Baystate Children’s Hospital.